Have you ever been talking with someone, wanted to give them the gospel, but it just would not come out of your mouth? We all know that if we try to steer a conversation, it normally goes bad because WE are DIRECTING things. Often, this tactic is noticed by the other person and frequently develops a negative or defensive response. Some have a more challenging complication in that they are not naturally evangelists. God has to prepare hearts for the reception of the gospel. Remember, we are saved BY grace THROUGH faith (Ephesians 2:8). God’s grace is projected to us through the preparation of our hearts for the gospel, then represented in the person who shares the gospel. What a joy we can experience to be the embodiment of God’s grace as we share the gospel. A challenge we have is to rush to do this. The lost heart is always on guard to protect its wickedness (John 8:44). Unless God has prepared that heart, broken the bonds of the evil one on that soul, opened that persons mind to the truth our efforts may be futile. Granted, we can be used for pure conviction, that may be our purpose in some witness. However, we want to be a blessing, an encouragement, we want to share God’s loving salvation. We want to be a positive not a negative. Unfortunately that is not our choice if we are given to serving God’s will, God’s purposes. Witness, that is what we are commanded to do. We cannot hold back, but we must recognize the right times regardless what God might use it for. In John 7:1-9, Jesus knew what the disciples were going to use Him for if he were to attend the Feast of Tabernacles. He knew they would use it for their own purposes, not to glorify the Father. We too must be sensitive to the motivations of others to misuse the gospel witness, your presence, your words and your time. 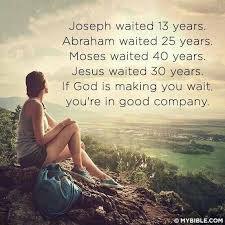 Wait on the timing of the Father just as Christ waited for the appropirate time. Wait on the direction of the Father just as Christ waited on His direction. This does not mean we sit back on our haunches, but that we must be that much more in touch with the Father and the Son. Do you wonder why your pastor encourages you to be in the Word? Why he encourages you to pray regularly? Those exercises keep us close to the Father and the Son. That is where we need to be if we are to accomplish His will and witness for His kingdom.